Early stories about the pyramids in China began right around the Second World War. A US Air Force pilot named James Gaussman reportedly saw a white-topped pyramid during a flight between China and India in 1945. Walter Hain, an author and science writer, reports in his homepages (see his article below) how Gaussman described his first sighting of the pyramid. "I banked to avoid a mountain and we came out over a level valley. Directly below was a gigantic white pyramid. It looked like something out of a fairy tale. It was encased in shimmering white. This could have been metal, or some sort of stone. It was pure white on all sides. The remarkable thing was the capstone, a huge piece of jewel-like material that could have been crystal. There was no way we could have landed, although we wanted to. We were struck by the immensity of the thing." The story was subsequently picked up by the New York Times, who ran a story about the pyramid on March 28, 1947. Colonel Maurice Sheahan, Far Eastern director of Trans World Airlines gave an interview saying he had seen a gigantic pyramid 40 miles southwest of Xian. Two days after the report, the same newspaper published a photo, which was later attributed to Gaussman. The worlds largest pyramid is rumored to be in Qin Lin county in a 'forbidden zone' of China, estimated at nearly 1,000 ft high and made of impounded earth and clay, and holding vast tombs. The Chinese govt have long denied the existence of 100 or so pyramids though the increasing tourism to the Xian tombs area (the Terracotta Army) is threatening the secrecy with tourists climbing the 25-100m pyramids for themselves. "I was searching for a pyramid which was said to have been, once, many millennia ago, multicolored, and to now be a dusty white. This was a pyramid which, legend has it, rises to the astonishing height of 1,000 feet - four-fifths the elevation of the Empire State Building. Not only was this extraordinary structure said to be the largest pyramid in the world (the Giant Pyramid of Egypt, by comparison, rises a mere 450 feet); but, in the valleys surrounding it, there were said to be dozens of other pyramids, some rising to an elevation almost as great. Until recently, Chinese officials have rebuffed all questions about these pyramids and all requests to view them. And yet, over this century, a certain mythology has grown up around them. An American trader, stumbling upon these amazing structures in 1912, asked his Buddhist monk-guide about them. He was told that 5,000-year-old monastic documents not only contained information about these pyramids, but said the pyramids were extremely old when these records were made. The trader, Fred Meyer Schroder, observed several smaller pyramids in the distance. He wrote in his travel diary that his first sight of the giant pyramid, along with its smaller cousins, rendered him almost speechless. "It was even more uncanny than if we had found it in the wilderness," he wrote. "But those [ pyra-mids) were to some extent exposed to the eyes of the world—but still totally unknown in the western world." "I flew around a mountain and then we came to a valley. Directly below us was a gigantic white pyramid. It looked as if it were from a fairy tale. The pyramid was draped in shimmering white. It could have been metal, or some other form of stone. It was white on all sides. What was most curious about it was its capstone: a large piece of precious gem-like material. I was deeply moved by the colossal size of the thing." 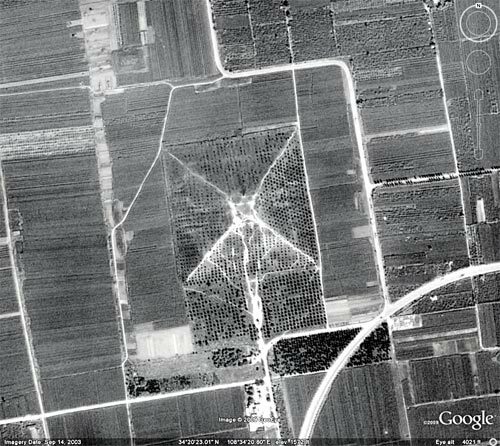 Two years later, in 1947, another U.S. aviator, Maurice Sheahan—this time flying over Shaanxi Province, not far from Xian-- caught sight of a giant pyramid in the misty landscape below and rapidly snapped pictures. This time, several U.S. newspapers, in-cluding the New York Times for March 28, 1947, published accounts of the airman’s sighting. But Chinese archaeologists con-tinued to deny the existence of such a structure, even though Sheahan’s photographs suggested it was higher than any pyramid in Egypt. " 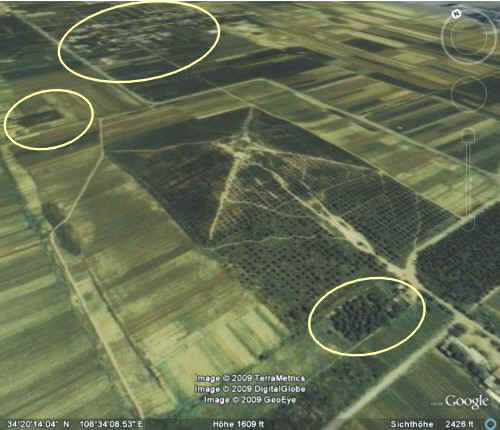 Today, with help of satellite images, we can be certain beyond any doubt that pyramids in China are real (and man-made). Pyramid near the City Xian, on 34.22 North and 108.41 East. The "White Pyramid" discovered! It is the Maoling Mausoleum! Since many years already in the popular scientific community and in publications there are many announcements and contentions of gigantic pyramids in China. The puzzle around the look-up seems final after new discoveries. With the help of Google Earth, the objects are to be seen impressively. It can not be maintained longer, there might be no pyramids in China.! They have four sides and they are even square like the pyramids in Egypt and in Mexico. Its size can quite be matched with those of the Pharaons and of the Mexican rulers. Already in 1912 of the two travel agents Fred Meyer Schroder and Oscar Maman reported of a tremendous building that they had seen in China. "It was more eerie than if we had found them in the wilderness. Here they had been under the nose of the world, but unknown to the western countries... The big pyramid is about 1,000 feet high (other descriptions estimate 1,000 to 1,200 feet high) and roughly 1,500 feet at the base, which makes it twice as large as any pyramid in Egypt. The four faces of the structure are oriented with the compass points," the two travellers reported. During the second world war, the pilot of the American Air Force, James Gaussman, with his co-pilot, flow - through a technical defect at his machine -, for several times over a specific territory in China. What he later reported sounds completely unbelievable: "I banked to avoid a mountain and we came out over a level valley. Directly below was a gigantic white pyramid. It looked like something out of a fairy tale. It was encased in shimmering white. This could have been metal, or some sort of stone. It was pure white on all sides. The remarkable thing was the capstone, a huge piece of jewel-like material that could have been crystal. There was no way we could have landed, although we wanted to. We were struck by the immensity of the thing", the pilots reported. On March 28, 1947 the "New York Times" reported about that discovery. In an interview with the newspaper, the former far east director of the Transworld Airlines, Maurice Sheahan, says he has seen 40 miles southwest of Xian a gigantic pyramid. "I was impressed by its perfect pyramidal form and its great size," says Sheahan. Later, on March 30, 1947 the "New York Sunday Times" take over the report and published at the first the photo, which is actually made in 1945 by Gaussman, and that was soon forgotten. In 1978 the New Zealand researcher Bruce L. Cathie bothered itself of a clarification of the puzzle. According to some correspondence with the Chinese embassy and the US air force he kept up the photo of 1947. He published the picture later in the first edition of his book "The Bridge to Infinity" of 1983. According to the photograph and the reports, the New Zealand researcher estimate that the pyramid must have at their basis a length of 450 meters (1500 feet) and a height of about 300 meters (1000 feet). It is a pyramid with four flat trapezoid shaped sides, a square plateau on the top and a square base, like the pyramids in Egypt and in Mexico. Such pyramids were up to now unknown to the experts in the western world and its existence was always denied: "There are no pyramids in China! Only pagodas - temple liked, peaked buildings", so the opinion of the world experts. found in the homepage of earthquest.co.uk of November 2001. I came to the "white pyramid" when I already read reports in specialized books before and then I saw the appropriate photograph in the book "The Face on Mars" of 1989 from the two Australian authors Brian Crowley and James J. Hurtak. Brian Crowley then sent a copy of the image in his book to me and then I passed it to Peter Krassa - a Austrian book author and China researcher. Later I published it in my German book "Das Marsgesicht" (The Face on Mars) of 1995. I have left indeed Peter Krassa the photograph, but I wanted to however make and therefore prove attentive, that there are in fact pyramids in China. At the German edition "Ancient Skies", the journal of the "Ancient Astronaut Society", no. 6, 1991, I published a short report. One did not want to however publish the photograph of 1947. Gene Phillips, the founder of the mentioned society, has refused a report from me in the American journal of the Society - with the reason, the photograph could be "something doctored", somehow falsified. He considered the photograph for a forgery. However, I was some extent amazed when I saw a German book in a bookshop in Hamburg, Germany - during a lecture trip - with the title "Die weisse Pyramide" (The white pyramid), written by Hartwig Hausdorf, he was until then completely unknown to me. The book appeared in 1994 and then I found out that Peter Krassa had made the photograph available to him - without my knowledge. However, Hartwig Hausdorf mentioned me in his book so the case is functional. Hartwig Hausdorf was very much strove anyway - and that was also my aim - for the thing and he has undertaken several China trips, around the report to go onto the basis. He found several pyramid mountains in China in fact and he has also published photographs from that. These were the first real evidence that there are pyramidal buildings in China exist. The "white pyramid" could constitute Hausdorf nonetheless not. Bruce L. Cathie announces many details in its book "The bridge to Infinity" over pyramids in China and especially over the "white pyramid" - so too precise coordinate information. They should be had found north of the contemporary city Sian (Xi´an), by the foot of the river Wei-ho - exact at 34.26 degrees of northern width and 108.52 degrees of eastern length. 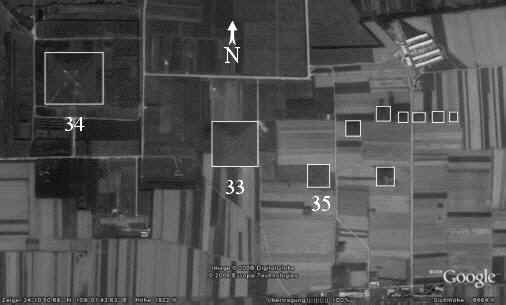 This data were for me very helpful when I searched in September 2006, with "Google Earth" over China after the pyramids. This program was in the last years set up extended from Google into the Internet and one can recognize phantastic details of the Earth's surface, by means of satellite consumption - as e.g. too the mysterious lines in the plain of Nazca. The solution is not in all fields optimally, nevertheless mostly quite well. According to some trouble I then kept up after the coordinate information of Bruce L. Cathie two pyramids. As result, I found further, more than twenty and bigger pyramids. They are square earth-pillars, constructed by Chinese craftsmen a long time ago very obviously. The professional world has therefore improper. There are indeed pyramids in China! Google Earth confirmed that again. The biggest one in this area is on 34.23 degrees North and 108.42 degrees East. The opinions diverge via the age of the pyramids. Some speak of 2500 to 3500 years. The legendary "Emperor of the prehistoric time" should at that time have been there. 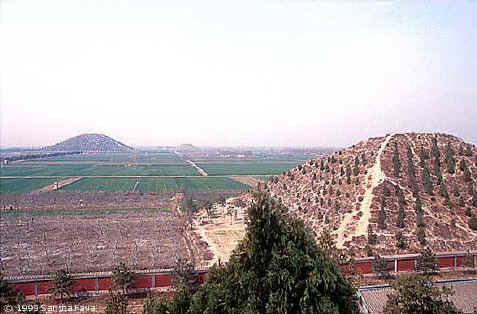 The pyramids are in the province Shaanxi, north of the city Sian (Xi´an). 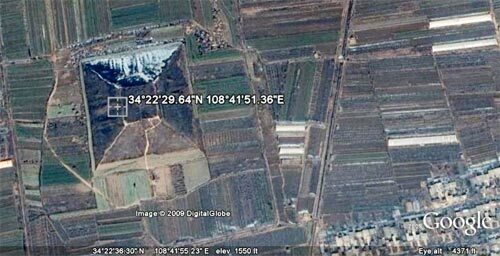 On the satellite photographs of Google Earth, no "white pyramid" is to be recognized. 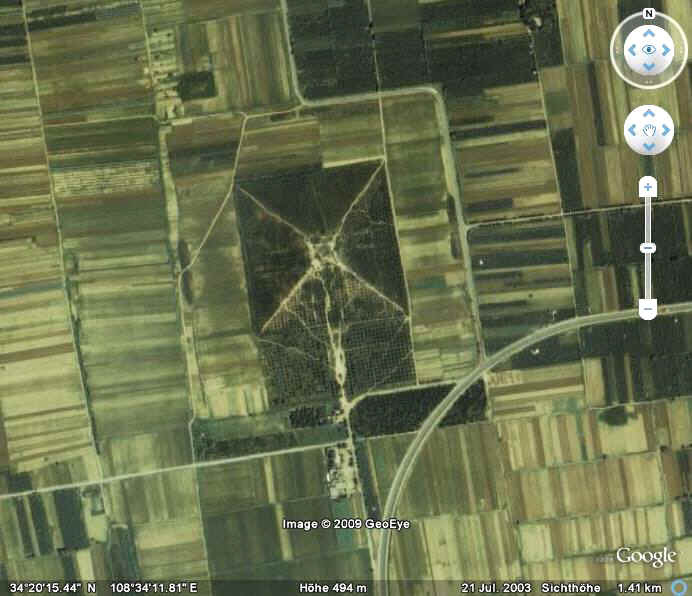 Under the coordinates 34.26 degrees of North and 108.52 degrees East, two pyramids are visible, but however they are not identical to the photo from 1947. The pyramid lying a little southwest, in my opinion, comes onto 34.22 North most of all and 108.41 East, north of the small city Hsien-yang into consideration. An arrangement shows similar factors as on the photograph from 1947: A square plateau, grazes (excavations) on the sidewalls, similar ones walkways (streets) and in the background, a small settlement. But that pyramid is definitely not the "white pyramid". In some Internet pages (Chris Maier) and in the homepage of wikipedia, the Maoling mausoleum is compared with the "white pyramid". And that is in actual fact correct. Already on former satellite images which were published in the homepage of earthquest.co.uk of November 2001, that is to be recognized. 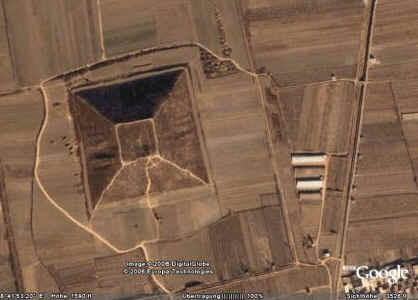 With Google Earth, this pyramid - although at present another with bad resolution - is it to be seen also. They lies west of the pyramids of Hsien-yang, close to the city Xianyang, on 30.20 degrees North and 108.34 degrees East. The "white pyramid" needs not to be a tremendous mystic building. The pilots and the travel agents to see the Maoling mausoleum, with his size - according to the measurements via Google Earth - of about 222 to 217 meters on the ground and his height of about 46 meters, can quite have appeared below glistening sunlight glimmering and quite big. No other pyramid in this area is so big. Only the one on 34.23 North and 108.42 East, which has a size of 219 to 230 meters on the ground. The well known Shi Huang-ti Mausoleum, situated 50 kilometers East, has a size of 357 to 354 meters on the base and the whole complex has a size of 488 to 581 meters. But that grave mountain is actually a square mound and not a pyramid. Attainable is the area near Hsien-yang over the city Xi´an (Sian) obvious the airport that Hartwig Hausdorf with some traveling companions already used in 1994. They could for instance constitute seventeen pyramids within a radius of about three kilometers and they estimated its heights at sixty to seventy meters. shows the same characteristics as the image of 1947. NEW!!! 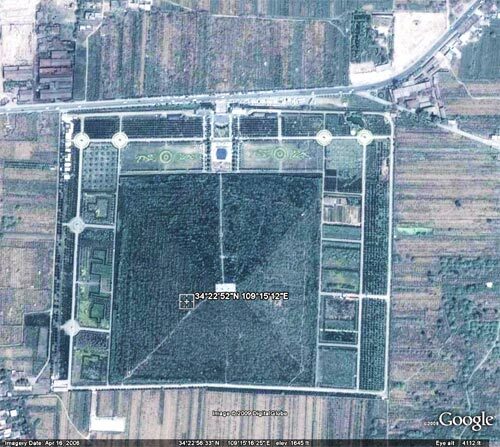 This pyramid, of February 2009 by Google Earth, shows again the wellknown Maoling Mausoleum but in a better solution from GeoEye. 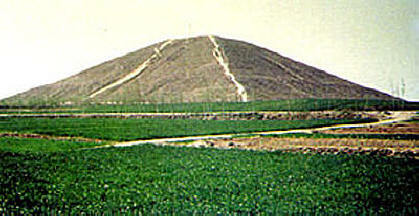 The comparison above shows that is indeed the "white pyramid". By the new aperture of China to the west, the corresponding investigations too would be able to be made amenable now at last for experts from other countries. For the better sense of China and of its past. 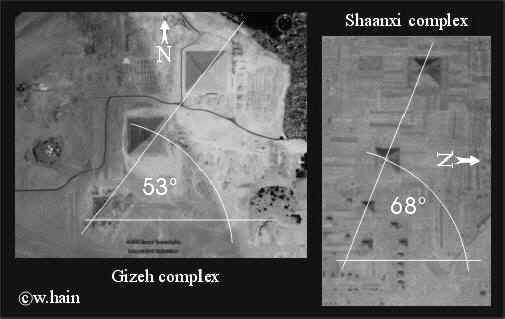 with a pyramid complex in Shaanxi (bottom image)..
Pyramids in China - map (click to enlarge). Copyright 2006-2009 by Walter Hain. Presented with permission of the author. Krassa, Peter: "...und kamen auf feurigen Drachen", Vienna, Austria 1984. Hain, Walter: Das Marsgesicht, Munich, Germany 1995. Hausdorf, Hartwig: Die weisse Pyramide, Munich, Germany 1994. -"- : The Chinese Roswell, Florida, USA 1998. Crowley, Brian; Hurtak, James J.: The Face on Mars, Australia 1989. Cathie, Bruce L.: The Bridge to Infinity, Boulder, USA 1989 (first edition USA 1983). Like his predecessor, Heinrich Harrer, who spent seven years in Tibet, Hartwig Hausdorf has ventured, virtually on foot, over many of the sacred places of the Far East. But his aim has been not to discover his own soul, but rather to uncover tell-tale traces of an Alien Mind which may have passed that way millennia ago, and may be passing by again. He has sought out the fabled, forbidden 1,000-foot White Pyramid of Xian. In so doing, he has stumbled upon the key to the ancient Chinese dream of material immortality, a dream perhaps inspired by Alien Mind, and a key hidden in the fabulous, mercury-filled tomb--chamber of the Emperor Shi Huangdi--a tomb-chamber the possible excavation of which the Chinese government has kept secret from the West. He has unearthed new facts about the mysterious stone disks of Bayan Kara Ula, which some believe tell the story of a forced alien landing 12,000 years ago. And he has discerned, in the prodigious mind-over-matter techniques of the Tibetans, the Chinese and the Japanese, the faintest whispers, still audible over the vast gulf of time, of an awesome encounter which may have taken place on the sacred peak of Mount Meru at the very beginning of man's time on earth. It is full of anecdotes of the author's travels and contains details that many other history books gloss over as being too trivial; the result is a richer, fuller account of many different peoples and places in an easy-to-read, conversational style. In fact, the book is almost an historical travel guide. I thought that the reader who criticised the book as being full of crackpot theories was being very unfair. Sure, the author comes across as a bit of a hippie, but so what? Are his opinions any less valid just because he subscribes to some beliefs that many others don't share. The only question is whether these beliefs bias his work. They don't. Read it and enjoy. Best known today as they site of the magnificent archaeological treasure of the Terracotta Army of the First Emperor of China, Xi'an was the ancient capital of China for four dynasties - some 1,100 years. The outstanding archaeological and art discoveries in the around the city tell the tale of China's development from prehistoric times till the height of the imperial period. Xi'an, or Chang'an it was formerly known, is also the eastern starting point of the fabled Silk Road. This profusely illustrated book guides the reader in a journey through time from the stone-age Banpo site, through Ming dynasty relics to a bustling modern-day city. Special essays and carefully selected literary excerpts provide a counterpoint to the practical information needed by the visitor. Xi'an is the capital of Shaanxi Province. Because of its long history and rich culture, it is famed as the "museum of nature and history in China". As the capital of 11 dynasties, it is encircled by a city wall, dotted with many temples, imperial tombs and gardens, and proud of its Terracotta Army of Qin Shihuang, the "Eighth Wonder in the World", leaving a deep impression on tourists. Color Illustrations. Captain Bruce Cathie shows how HARMONICS - wave forms of light - and their interaction and resonance, form the basis or "matrix" of the universe. Advanced applications for space travel, "free" energy production and much more could be developed. An important book, filled with mathematical data and derivations to back up his case. He shows examples of how the ancients used this knowledge to design the Great Pyramid, the world grid system, and even the basis for the English system of measurement. He is convinced a secret group is utilizing this knowledge and purposefully keeping the world ignorant and backward. Based upon the impact this kind of advancement would have on the "profitable" fossil fuel monopoly, it's hard to argue with him. Carefully written for both the scientist and the layman, The Bridge To Infinity is a powerful and important book and ahead of its time. To those with a scientific background, it's a "must-read". To those without such a background, I say READ IT ANYWAY. Pyramids of China, White pyramid, Maoling, Xi'an.